These delightful brachiopods are from the Matmor Formation (Jurassic, Callovian) of the Negev in southern Israel. They are part of a long-term Wooster project describing and interpreting a diverse paleocommunity. The latest trip to study these fossils was this past March with Melissa Torma and our Israeli colleague Yoav Avni. The shells above are Burmirhynchia jirbaenesis Muir-Wood 1935. We identified them using the excellent work on Matmor brachiopods by Feldman et al. (2001). 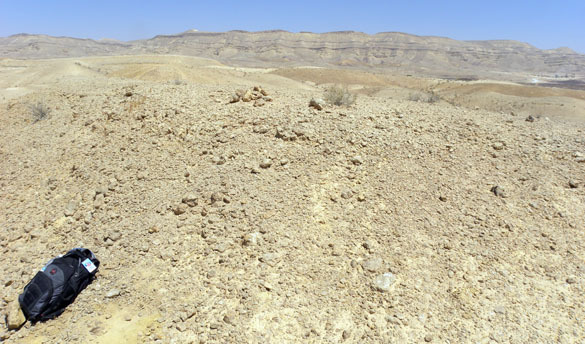 The location in Makhtesh Gadol, Negev, Israel, where these specimens were collected. Burmirhynchia jirbaensis was originally named from a collection of specimens found in the Biheh Limestone of the Jirba Range in British Somaliland (modern-day Somalia). This is a wonderful place for Jurassic paleontology, but not one I’m likely to visit soon! Burmirhynchia is an important brachiopod in the Jurassic of the Tethyan Realm. It has been found throughout the Middle East, southern Europe, Africa and Australia. It has, apparently, been overly “split” into over 90 species, most of which are dubious at best (Shi and Grant, 1993). B. jirbaensis, though, is a legitimate species based on internal characteristics you can only see by sectioning or internal tomography (Feldman et al., 2001). The genus Burmirhynchia was described in 1917 by an interesting character: Sydney Savory Buckman (1860-1929). 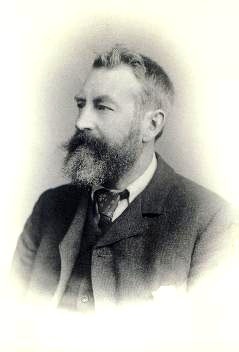 Buckman is best known for his work on ammonites, but he was also a novelist, social reformer and (gasp) a fossil dealer (to support his geological work). He was born in Cirencester, England, but grew up in Dorset among some of the most spectacular Jurassic geology in the world. Buckman was briefly a farmer, but he most enjoyed amateur geology and working on collections in local museums. Ammonites were his passion — he worked on several large monographs describing hundreds of new species. (The complaints about his taxonomic splitting began then.) His most eccentric idea was that ammonites may have suffered from a kind of flatulence produced by “nervous apprehension of danger”, with the resulting gas increasing their buoyancy and helping them flee to safety. I don’t recall hearing that one in school! Curiously enough, Sydney Savory Buckman made one progressive addition to the vocabulary of paleontology: in 1893 he invented the term “palaeo-biology” (Sepkoski, 2012). Feldman, H.R., Owen, E.F. and Hirsch, F. 2001. Brachiopods from the Jurassic (Callovian) of Hamakhtesh Hagadol (Kurnub Anticline), southern Israel. Palaeontology 44: 637–658. Sepkoski, D. 2012. Rereading the Fossil Record: The Growth of Paleobiology as an Evolutionary Discipline. University Of Chicago Press, Chicago, 440 pages.